Australia Post provides exceptional postal services throughout Australia and its overseas territories. 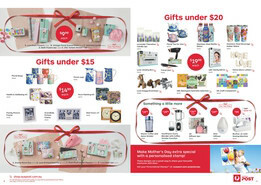 Shop at Australia Post online to browse the latest catalogues and weekly ads for fantastic deals and savings. Moving house? Changing address? Have your personal mail delivered wherever you go within Australia or overseas. 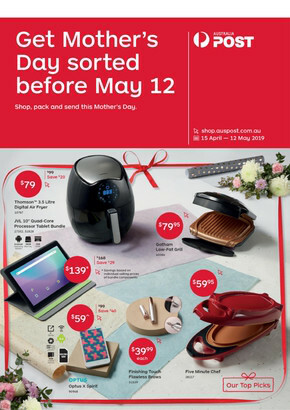 Go to Australia Post online to redirect your mail from as little as $24.90. Australia Post can hold your mail for up to 12 months and deliver it upon your return. Australia Post also offers 3 choices of delivery speeds when sending a letter within Australia. Choose from Regular, Priority or Express Post, depending on your needs. With Australia Post’s Click and Send, you can print your own postage labels to send parcels within Australia or overseas. Simply pack your parcel using your own packaging, print your postage label (which you can pay for online) and send your parcel by dropping it off at a Post Office, street posting box or arrange a parcel pickup from selected locations. Benefits of using Click and Send include flat rate postage and flexible payments. For store locations, opening hours, or to browse the latest flyer, visit Shopfully website or app.